The first convention Callie ever attended was a VikingCon back in the mid-1980's, when Larry Niven and Jerry Pournelle were Guests of Honor. She also attended a few Norwescons around the same time. In 1985, she moved to Oregon and promptly began making music with anyone who didn't prudently flee. In the process Callie founded two Renaissance consorts and two madrigal groups. She has wrestled recorders, pennywhistles and even guitar into varying degrees of submission, but her real motto is, "have flutes, will travel". She plays both the standard transverse C flute and its big brother the bass flute. She also writes and arranges music with a special focus on counter melody and close harmonies. Callie's first experience with studio recording was in 1991 where she discovered that she loves adding backing tracks as a studio musician almost as much as she loathes the role of producer. Well, not loathes, but she does find it tedious. Callie's vocal and woodwind harmonies can be found on several filk CDs, most notably those of Echo's Children (http://www.echoschildren.org), a group she co-founded in 1997 with Cat Faber. Echo's Children performed for several years in diverse locations across the US and Canada, and produced four studio CDs, but has since gone on hiatus. In 2003 she produced the final Echo’s Children CD, "Nuts from the Hazel Tree" as well as the Echo's Children Songbook. Now everyone can play and sing along as we keep this music alive. Callie has also recorded tracks on Steve Macdonald’s "Reap The Wind" and for his yet to be released recent work. 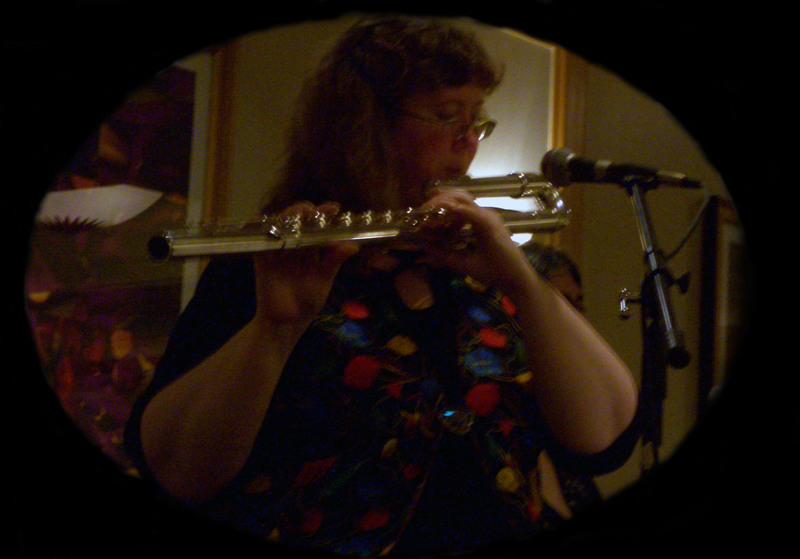 She provided both vocals and flute tracks for Blake Hodgetts' "Blindsight", Steve Savitzky's "Coffee, Computers, and Song", and Leslie Fish's "Lock and Load", and has contributed flute, bass flute and vocal parts for Juliana McCorison’s soon to be released CD. In 2005 Callie produced and provided lead soprano vocals for the madrigal CD "Since Robin Hood", by theSherwood Renaissance Singers. In the odd moments when she isn't making music Callie often can be found geeking, knitting, or weaving. All of these are absorbing and occasionally profitable activities. If wide varieties of colors and textures interest you, ask about her stash of hand-knitted scarves sometime.